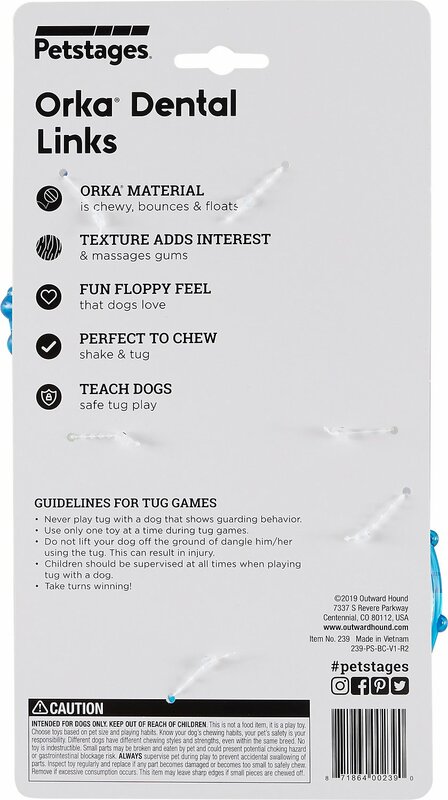 Designed for dogs that love to chew, Petstages ORKA chew toys are made of a durable, non-toxic, synthetic rubber, combining fun and function in one toy. By providing a dog with an appropriate chew object, owners can help reduce a dog's boredom and destructive behavior. The ORKA Dental Links rope cleans dog's teeth and gums when chewing and playing! 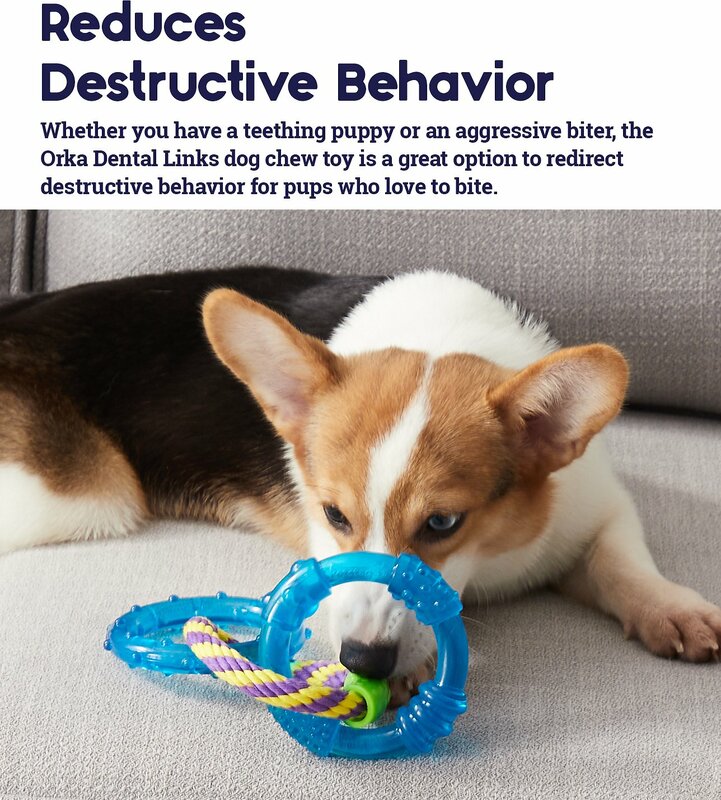 Petstages ORKA chew toys are made for power chewers, providing your pup with an appropriate chew while helping to reduce boredom and destructive behavior. Reinforced with inner ribs and raised diamond textures, these toys stand up to tough chewing while keeping dogs interested and satisfied. Solid rings are incredibly durable and can stand up to any game of tug! Orka Dental Links by Petstages are fun to shake, chew, and tug. 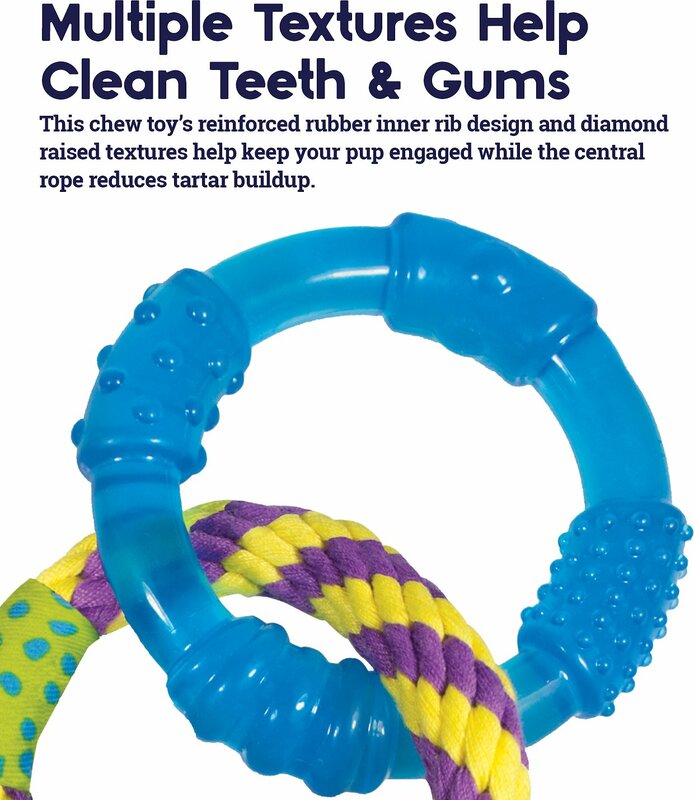 Tough rope ring helps remove soft tartar as dog chews. Petstages' dog toys are all about having fun, but they're also made to address your pup's most primal needs. Their innovative chew toys satisfy that intense urge to gnaw, and behind the scenes, they're also helping to keep his teeth clean or keeping him cool and collected while you're away. Just like their name says, Petstages makes toys for every stage of development to keep him fit, entertained and engaged from puppyhood to his senior days. Whether it's an intense game of fetch or a quiet chewing session to wind down before bedtime, Petstages chew toys have it covered. The ORKA Tennis Ball has unique ridges that give your dog's teeth and gums a workout, and it's durable enough for stronger jaws. He'll be panting with anticipation for you to throw this bouncy ball as soon as you pull it out of the toy bin. For more traditional types, the Dogwood Stick combines real wood—complete with a natural woodsy smell—and non-toxic material that makes it safer to retrieve than the average stick. Got puppy teething problems? Petstages Cool Teething Stick and Mini Cool Chew are ice cold, but they can melt away the discomfort a puppy can feel when his new teeth are coming in. When they're frozen, they make a crunching sound that dogs love. The cotton-poly blend fabric plus the icy interior give puppies soothing relief for their tender gums. Even though they're great for growing canines, dogs of all ages find the cool crunch irresistible, and the knotted streamers and ribbons add extra chewing pleasure. Dogs can get pretty stressed out, especially when their people leave the house. Without something to focus their attention on, they can easily work themselves into a frenzy that leaves a whirlwind of chewed-up belongings in its wake. Petstages calming toys can help keep your little bundle of nerves relaxed while he's home alone. The Puppy Cuddle Pal eases separation anxiety and wards off the doggy blues with a warm, soft toy that pups can cuddle up to. It's great for helping new puppies settle in or for seniors that tend to worry. Petstages makes reliable products that you can count on in every stage of your pet's life. 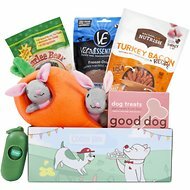 They partner with pet experts to create the most inventive developmental toys, which they like to call "products with purpose." These toys doger to the instinctual needs of dogs and dogs, giving them durable toys for playing, interacting, scratching, chasing, chewing, kicking, biting and even snuggling. No matter your pet's need, Petstages is committed to fulfilling it through constant innovation. My dog is a power chewer. A 4-legged chainsaw if you will. The center rope ring didn't last a day, however the two blue rings are his favorite toys to play with. They've lasted since I purchased them about six months ago. I have a 60lbs Lab who is 1.5 years for reference. It cracks us up because it looks like he's playing with baby toys, but they keep him so entertained, and he'll have on in his mouth while he kicks the other around on the floor. I'm giving this 4 stars even though the rope didn't last because he **hasn't destroyed the rings yet**, and that in itself is a major victory. Also great for catch coordination practice. rope never had a chance! My puppy isn’t an aggressive chewer but just playing tug with her one day had the rope ring frayed and untangling. Won’t be long before it’s in the trash. She has no interest in the blue rings, so triple trash! I ordered this toy for my 6 lb, 6 month old Morkie. It arrived on Monday, but by Thursday at noon, she had chewed off the fabric sleeve and pulled apart the rope ring holding the other 2 rings. This is not a safe toy to last but 3 days?? Love this product, especially the option of chilling it in the refrigerator. My puppy loves playing tug of war with it. Has held up well. Our girls loved this toy but they both loved the center ring too much when they discovered it was much more fun to unravel it & play tug of war with the individual blue rings. They should make all three rings rubber and skip the rope one that frays too easily. Our dog loved this as a tugging toy but within just a few days the middle section came apart. The rope part is going to break...but the rubber rings have been my boy's favorite things for 6+ months now. He is a power chewer too. We rotate toys to keep interest. If you have an aggressive chewer. I would not recommend. My pup had them ( I bought 2 ) destroyed in 1 day. Chewed the blue rings into pieces.